While I was off gallivanting in London, Halloween happened. 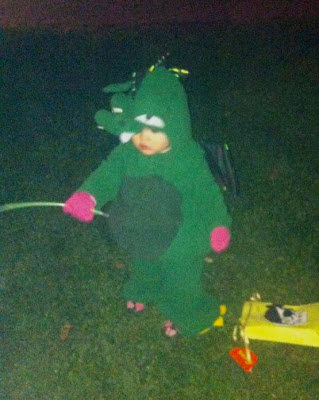 Ez managed to grab this dragon costume for Johnnie at Old Navy while I wasn't looking, and he put it on her before I left for my trip so I wouldn't miss her big debut. (How sweet is my husband?) I heard a knock on the bathroom door, and when I opened it there was little Puff, staring up at me from under her dragony snout. She was a little uncertain at first, but when she realized she was the cutest dang thing on two legs (and after her dad pinned the nose up a little bit so she could see better) she owned that dragon costume. Father and daughter attended a Halloween party at our friends' house, which is located in a friendly neighborhood well traveled with trick-or-treaters. Johnnie got a glow stick (jackpot!) and spent the evening dancing and playing with her little friends (Spiderman, Dorothy and the Cowardly Lion). Few pictures were taken of the elusive dragon, because she was too busy having fun. I love the dragon costume! I am a crazy person and already got next year's costume (on crazy sale).